This volume is the first of a new series edited by the International Bureau of the Permanent Court of Arbitration (PCA) – The PCA/Peace Palace Papers – which contains the papers emanating from the semi-annual seminars organized by the PCA in the Peace Palace. Each seminar focuses on a topical issue of international law. The first seminar was held on December 9, 1999, and dealt with Institutional and Procedural Aspects of Mass Claims Settlement Systems . Four speakers from Europe and the United States, recognized experts in their field, shared their practical experience with the respective systems dealing with mass claims. 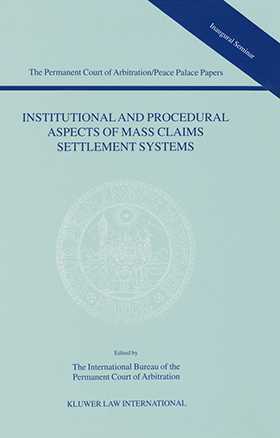 This volume offers the reader a bird's-eye view of major mass claims settlement systems currently operational, and provides useful insights for persons charged with the setting up of new international claims settlement tribunals. The PCA's International Bureau is ready to assist them in those endeavors.